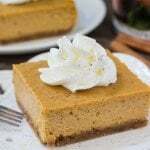 Smooth, creamy, super easy Pumpkin Cheesecake Bars. 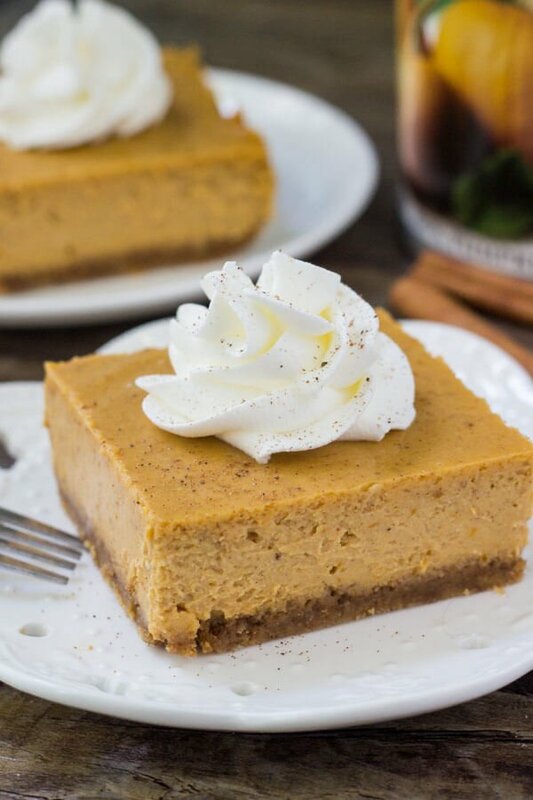 With a graham cracker crust and filled with fall spices – this pumpkin cheesecake recipe is the perfect dessert for fall. I absolutely love cheesecake. And when pumpkin season comes around – there’s nothing that makes me happier than a slice of pumpkin cheesecake. Well – I guess a square of pumpkin cheesecake in this case. Because shouldn’t every season be commemorated with cheesecake? Now this year I’ve started on the fall recipe train especially early because come September my life is getting a leeeeettle bit different. I’m actually heading to Seattle for a month long yoga teaching course (mic drop), which I’m ridiculously excited about. (Like can’t sleep at night style). But it also means that I’ve been baking up a storm to get everything organized before I leave. Baking in a kitchen that I’m unfamiliar with just never seems to go that well. Plus, I need to stock our freezer with baked goods so that Jay doesn’t get fired from work because he stopped bringing treats for his coworkers. So ipso facto – today, in August, I’m sharing these pumpkin cheesecake squares. And seriously, these pumpkin cheesecake squares are a hit any time of year. They start with a cinnamon infused graham cracker crust. 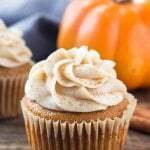 Then the pumpkin cheesecake is filled with brown sugar, pumpkin pie spices & vanilla for the perfect flavor. Smooth, creamy, delicious pumpkin cheesecake – every time. If you’re having a lot of people over for Thanksgiving, these pumpkin cheesecake bars are the perfect thing. Or if you’re looking for a pumpkin dessert other than pie, then I definitely recommend making these. 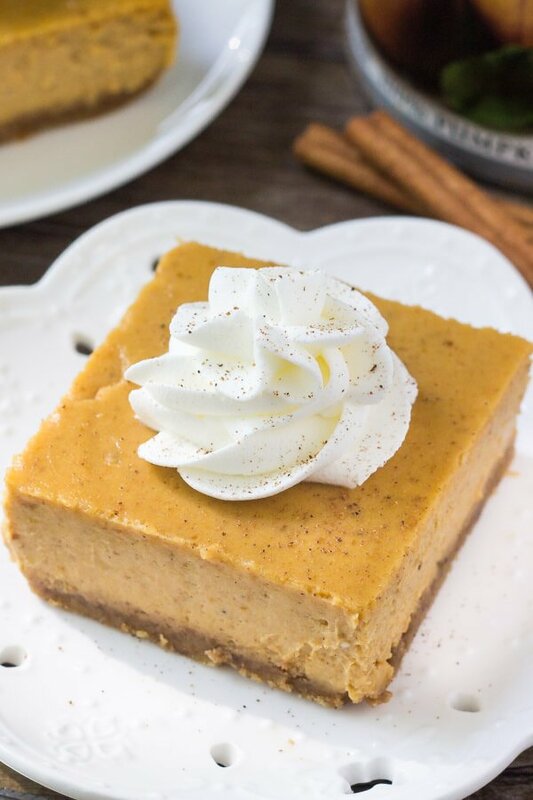 Smooth, creamy, super easy Pumpkin Cheesecake Bars. 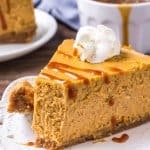 With a graham cracker crust and filled with fall spices - this pumpkin cheesecake recipe is the perfect dessert for fall. Make the crust. In a medium bowl stir together the graham crumbs, melted butter, brown sugar & cinnamon. Press into the bottom of the prepared pan and bake for 8 minutes. Make the filling. In a medium bowl stir together the sugars, pumpkin pie spice, cornstarch & salt. In a large bowl beat the cream cheese until soft. Then beat in the sugar mixture. With the mixer on low beat in the sour cream, pumpkin puree & vanilla extract, followed by the eggs one at a time. Only beat until the eggs are just combined. Bake for 40-45 minutes, or until theres just a slight wobble in the middle of the cheesecake. Turn off the oven and open the oven door. Allow the cheesecake to cool in the oven with the door open for 30 minutes. Then remove from the oven and continue cooling to room temperature. Then place the cheesecake in the fridge to chill for at least 4 hours or overnight. And if you love these pumpkin cheesecake bars, try these too! HI Fiona — I wanted to make these for Thanksgiving but I had one concern. you mentioned using vanilla in the text of the recipe but not in the ingredients list. I was wondering how much vanilla to use? Thanks and Happy Thanksgiving. 2 teaspoons of vanilla extract! Happy Thanksgiving!